Friday the 13th need not be unlucky. 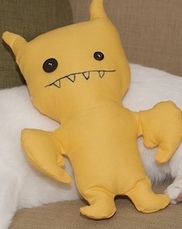 Take this monster stuffie, for example. Try as he might, this little guy can’t help but be cute. Get the free pattern from Elizabeth, You Were Born to Play that Part and make one for yourself. Thanks for featuring my pattern! I was up until 1am saturday morning making this little cutie… I LOVE this pattern… I named my bat George. Thanks for creating him and thanks for posting.